New houses for sale in North Scarle Lincoln and South Scarle, Newark. For further information and prices please call Alison, our new Homes sales representative Tel. 07717 505 448 or call our Main Office on 01522 778455. Two individual 5 bedroom Homes between the villages of Thorpe on the Hill and Whisby, one mile from the city of Lincoln. OPEN DAY We are having an open day at our site on Thorpe Rd, Whisby, please contact Alison for further details. Flooring  Floor tiling to Kitchen/Diner/Utility  Wooden flooring to hallway. Wall Finishes  Emulsion to walls in three pale colours  Tiling to 1200mm high in bathrooms  Tiling to kitchen walls from granite to underside of wall units. Ceilings  All painted white  Coving to all reception rooms and landings. Woodwork  Stained or white gloss painted architrave, skirting and doors, and solid Ash stairs. Kitchen  Granite work surfaces  Matchmaker fitted kitchen  Stainless steel free standing fridge/freezer  Stainless steel free standing range cooker (LPG hob and electric oven)  Stainless steel extractor hood  Integrated dishwasher  Stainless steel sink and taps Utility Room  Units to match kitchen  Space for tumble drier and washing machine (not supplied). Bathrooms  Heated towel rail to main bathroom  White sanitaryware with chrome taps and fittings to all bathrooms & en suites. Plumbing and Heating  Underfloor heating throughout the ground floor  Oil fired condensing boiler  Pressurised hot water system  Outside tap. Electrics  Satellite points provided  B.T. Points  Alarm  multi zone and wired in smoke detectors  Downlighters in kitchen ceiling  Pelmet lighting in kitchen under units  Centre ceiling lights to all other rooms  External lantern lights. An individual 3 bedroom Bungalow in the village of North Scarle. 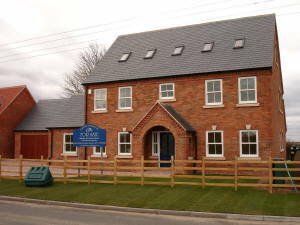 New Homes at The Gables, Eagle Road, North Scarle, Lincoln. 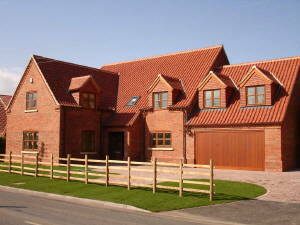 A Prestigious new development of 3,5 & 6 bedroom homes in North Scarle, Lincoln. To see Pictures of work in progress at North Scarle click here. In recognition of the extensive projects that we have been able to undertake in the village of North Scarle, we have erected four Millenium village signs at the entrances to the village. Also pictured is the opening ceremony of the memorial garden, close to the church on the outskirts of the village. We designed and created a peaceful area for reflection incorporating a shelter, the original well on the site, and a remembrance garden. A prestigious 4 bedroom Bungalow set in a large plot & Two 3 and 4 bedroom cottages in the village of South Scarle.